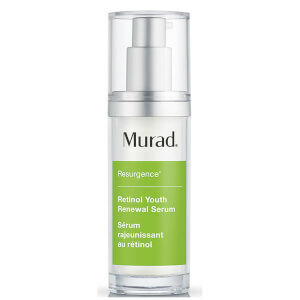 Rediscover your skin's youthful capacity with Murad's Retinol Youth Renewal Night Cream; a breakthrough, anti-aging formula that works to combat common concerns as you sleep. Powered by Retinol Tri-Active Technology (a fast-acting Retinoid, a time-released Retinol and a Retinol booster), the lightweight, quick-absorbing cream helps to minimize the appearance of fine lines, wrinkles and uneven texture for a smoother, younger-looking complexion come morning. Delivering long-lasting moisture and hydration, its blend of Swertia Flower Extract and peptide-rich Red Algae Extract create a lifting and firming effect to help improve elasticity and redefine facial contours. Wake up to revitalized, refined skin with restored luminosity. Free from parabens, sulfates, phthalates and gluten. Thoroughly cleanse skin and pat dry. Press to dispense a precise amount of cream. Massage evenly to face, neck and chest, using sweeping upward movements. Water/Aqua/Eau, Dimethicone, Glycerin, Butyrospermum Parkii (Shea) Butter, Stearyl Dimethicone, Caprylic/Capric Triglyceride, Arachidyl Alcohol, Octyldodecanol, Cetearyl Alcohol, Squalane, Borago Officinalis Seed Oil, Retinyl Propionate, Retinol, Swertia Chirata Leaf Extract, Urea, Yeast Amino Acids, Trehalose, Inositol, Taurine, Betaine, Glycine Soja (Soybean) Extract, Polymethylsilsesquioxane, Macrocystis Pyrifera (Kelp) Extract, Hydrolyzed Vegetable Protein, PVP, Ahnfeltiopsis Concinna Extract, Isopropyl Palmitate, Lecithin, Cetearyl Olivate, Octadecane, Disteardimonium Hectorite, Propylene Carbonate, Oleyl Alcohol, Dioscorea Villosa (Wild Yam) Root Extract, Glycine Soja (Soybean) Sterols, Hydrolyzed Yeast Extract, Cetyl Hydroxyethylcellulose, Polyglucuronic Acid, Sorbitan Olivate, Behenyl Alcohol, Arachidyl Glucoside, Tocopheryl Acetate, Zinc Gluconate, Sodium Polyacrylate, Dicaprylyl Carbonate, Polyglyceryl-3 Caprate, Xanthan Gum, Disodium EDTA, Sodium Hydroxide, Phenoxyethanol, Caprylyl Glycol, Chlorphenesin, Fragrance (Parfum), Alpha-Isomethyl Ionone, Citronellol, Yellow 5 (CI 19140), Red 4 (CI 14700).